↑ Darren Sumner (May 10, 2011). "Smallville bows this week — with Stargate's world record". GateWorld. สืบค้นเมื่อ May 11, 2011. ↑ Erickson, Hal. 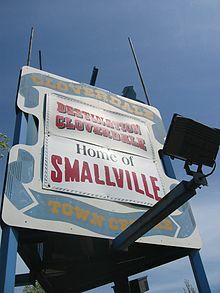 "Smallville [TV Series]". Allmovie. Rovi Corporation. สืบค้นเมื่อ January 16, 2013. ↑ David Lambert (April 26, 2011). "The Complete Series on DVD: Timeframe, Packaging, New Extras and Answer to 'Why Not On Blu-ray?'". TVShowsOnDVD.com. สืบค้นเมื่อ April 26, 2011. ↑ David Lambert. "Finalized Date, Bonus Items, Packaging for the Complete Series and The 10th Season Sets". TVShowsOnDVD.com. สืบค้นเมื่อ July 26, 2011. ↑ "How did your favorite show rate? (2001-02)". USA Today. May 28, 2002. ↑ "2003-04 Ratings". ABC Medianet. Archived from the original on September 30, 2007. ↑ "2004-05 Primetime Wrap". Hollywood Reporter. May 27, 2005. ↑ "Series". The Hollywood Reporter. May 26, 2006. ↑ "2006-07 primetime wrap". The Hollywood Reporter. May 25, 2007. ↑ "Weekly Program Rankings". ABC Medianet. May 20, 2008. ↑ "Weekly Program Rankings". ABC Medianet. May 19, 2008. ↑ Paul Millar (May 16, 2010). "2.5m watch 'Smallville' season finale". Digital Spy. สืบค้นเมื่อ May 16, 2010. ↑ Andreeva, Nellie (May 27, 2011). "Full 2010-2011 TV Season Series Rankings". Deadline. สืบค้นเมื่อ June 1, 2011. หน้านี้แก้ไขล่าสุดเมื่อวันที่ 18 ธันวาคม 2559 เวลา 15:36 น.